The species Canis lupus was first recorded by Carl Linnaeus in his publication Systema Naturae in 1758,  with the Latin classification translating into the English words "dog wolf". 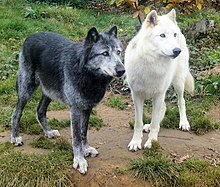 The 38 subspecies of Canis lupus are listed under the designated common name of "wolf" in Mammal Species of the World (3rd edition) that was published in 2005. 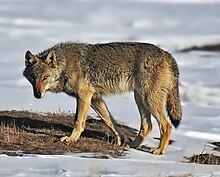 The nominate subspecies is the Eurasian wolf (Canis lupus lupus), also known as the common wolf. 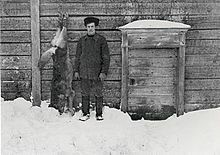 The subspecies include the domestic dog, dingo, eastern wolf and red wolf, but lists C. l. italicus as a synonym of C. l. lupus. However, the classification of several as either species or subspecies has recently been challenged. 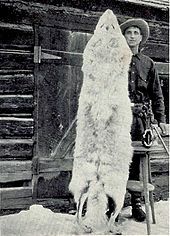 The archaeological and paleontological records show gray wolf continuous presence for at least the last 300,000 years. This continuous presence contrasts with genomic analyses, which suggest that all modern wolves and dogs descend from a common ancestral wolf population    that existed as recently as 20,000 years ago. These analyses indicate a population bottleneck, followed by a rapid radiation from an ancestral population at a time during, or just after, the Last Glacial Maximum. However, the geographic origin of this radiation is not known. Generally, wolves have a high heart weight of 0.93%–1.07% total body mass compared to the average mammal at 0.59% total body mass. 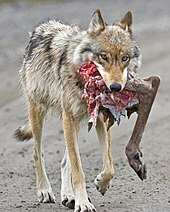 Wolves have a decreased heart rate suggesting cardiac enlargement and hypertrophy. Tibetan gray wolves, which occupy territories up to 3,000 above sea level, have evolved hearts that withstand the low oxygen levels. Specifically, these wolves have a strong selection for RYR2, a gene that initiates cardiac excitation. Facial expressions ( Konrad Lorenz, 1952). Bottom to top: increasing fear (ears back); left to right: increasing aggression (snarl); top right: maximum of both. The wolf is a common motif in the foundational mythologies and cosmologies of peoples throughout Eurasia and North America (corresponding to the historical extent of the habitat of the gray wolf). The obvious attribute of the wolf is its nature of a predator, and correspondingly it is strongly associated with danger and destruction, making it the symbol of the warrior on one hand, and that of the devil on the other. 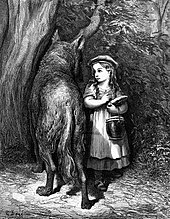 The modern trope of the Big Bad Wolf is a development of this. 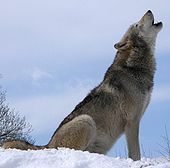 The wolf holds great importance in the cultures and religions of the nomadic peoples, both of the Eurasian steppe and of the North American Plains. In many cultures, the identification of the warrior with the wolf ( totemism) gave rise to the notion of Lycanthropy, the mythical or ritual identification of man and wolf. ^ Tedford, Richard H.; Wang, Xiaoming; Taylor, Beryl E. (2009). 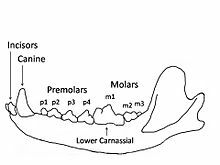 "Phylogenetic Systematics of the North American Fossil Caninae (Carnivora: Canidae)" (PDF). Bulletin of the American Museum of Natural History. 325: 1–218. doi: 10.1206/574.1. hdl: 2246/5999. ^ a b Mech, L. D.; Christensen, B. W.; Asa, C. S.; Callahan, M; Young, J. K. (2014). 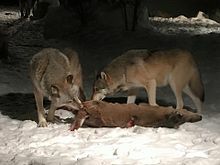 "Production of Hybrids between Western Gray Wolves and Western Coyotes". PLOS One. 9 (2): e88861. Bibcode: 2014PLoSO...988861M. doi: 10.1371/journal.pone.0088861. PMC 3934856. PMID 24586418. ^ a b Gaubert P, Bloch C, Benyacoub S, Abdelhamid A, Pagani P, et al. (2012). "Reviving the African Wolf Canis lupus lupaster in North and West Africa: A Mitochondrial Lineage Ranging More than 6,000 km Wide". PLOS One. 7 (8): e42740. Bibcode: 2012PLoSO...742740G. doi: 10.1371/journal.pone.0042740. PMC 3416759. PMID 22900047. ^ a b Moura, A. E.; Tsingarska, E.; Dąbrowski, M. J.; Czarnomska, S. D.; Jędrzejewska, B. A.; Pilot, M. G. (2013). 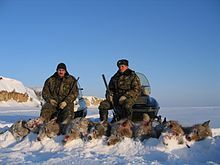 "Unregulated hunting and genetic recovery from a severe population decline: The cautionary case of Bulgarian wolves". Conservation Genetics. 15 (2): 405–417. doi: 10.1007/s10592-013-0547-y. ^ Musiani M, Leonard JA, Cluff H, Gates CC, Mariani S, et al. (2007). "Differentiation of tundra/taiga and boreal coniferous forest wolves: genetics, coat colour and association with migratory caribou". Mol. Ecol. 16 (19): 4149–70. doi: 10.1111/j.1365-294x.2007.03458.x. PMID 17725575. ^ a b c Schweizer, Rena M.; Vonholdt, Bridgett M.; Harrigan, Ryan; Knowles, James C.; Musiani, Marco; Coltman, David; Novembre, John; Wayne, Robert K. (2016). "Genetic subdivision and candidate genes under selection in North American grey wolves". Molecular Ecology. 25 (1): 380–402. doi: 10.1111/mec.13364. PMID 26333947. ^ Geffen, ELI; Anderson, Marti J.; Wayne, Robert K. (2004). "Climate and habitat barriers to dispersal in the highly mobile grey wolf". Molecular Ecology. 13 (8): 2481–90. doi: 10.1111/j.1365-294X.2004.02244.x. PMID 15245420. ^ Pilot, Malgorzata; Jedrzejewski, Wlodzimierz; Branicki, Wojciech; Sidorovich, Vadim E.; Jedrzejewska, Bogumila; Stachura, Krystyna; Funk, Stephan M. (2006). "Ecological factors influence population genetic structure of European grey wolves". Molecular Ecology. 15 (14): 4533–53. doi: 10.1111/j.1365-294X.2006.03110.x. PMID 17107481. ^ Flower, Lucy O.H. ; Schreve, Danielle C. (2014). "An investigation of palaeodietary variability in European Pleistocene canids". Quaternary Science Reviews. 96: 188–203. Bibcode: 2014QSRv...96..188F. doi: 10.1016/j.quascirev.2014.04.015. ^ Sotnikova, M. (2010). "Dispersal of the Canini (Mammalia, Canidae: Caninae) across Eurasia during the Late Miocene to Early Pleistocene". Quaternary International. 212 (2): 86–97. Bibcode: 2010QuInt.212...86S. doi: 10.1016/j.quaint.2009.06.008. ^ a b Freedman, Adam H.; Gronau, Ilan; Schweizer, Rena M.; Ortega-Del Vecchyo, Diego; Han, Eunjung; Silva, Pedro M.; Galaverni, Marco; Fan, Zhenxin; Marx, Peter; Lorente-Galdos, Belen; Beale, Holly; Ramirez, Oscar; Hormozdiari, Farhad; Alkan, Can; Vilà, Carles; Squire, Kevin; Geffen, Eli; Kusak, Josip; Boyko, Adam R.; Parker, Heidi G.; Lee, Clarence; Tadigotla, Vasisht; Siepel, Adam; Bustamante, Carlos D.; Harkins, Timothy T.; Nelson, Stanley F.; Ostrander, Elaine A.; Marques-Bonet, Tomas; Wayne, Robert K.; et al. (2014). "Genome Sequencing Highlights the Dynamic Early History of Dogs". PLOS Genetics. 10 (1): e1004016. doi: 10.1371/journal.pgen.1004016. PMC 3894170. PMID 24453982. ^ Skoglund, Pontus; Ersmark, Erik; Palkopoulou, Eleftheria; Dalén, Love (2015). "Ancient Wolf Genome Reveals an Early Divergence of Domestic Dog Ancestors and Admixture into High-Latitude Breeds". Current Biology. 25 (11): 1515–1519. doi: 10.1016/j.cub.2015.04.019. PMID 26004765. ^ Fan, Zhenxin; Silva, Pedro; Gronau, Ilan; Wang, Shuoguo; Armero, Aitor Serres; Schweizer, Rena M.; Ramirez, Oscar; Pollinger, John; Galaverni, Marco; Ortega Del-Vecchyo, Diego; Du, Lianming; Zhang, Wenping; Zhang, Zhihe; Xing, Jinchuan; Vilà, Carles; Marques-Bonet, Tomas; Godinho, Raquel; Yue, Bisong; Wayne, Robert K. (2016). "Worldwide patterns of genomic variation and admixture in gray wolves". Genome Research. 26 (2): 163–73. doi: 10.1101/gr.197517.115. PMC 4728369. PMID 26680994. ^ Gopalakrishnan, Shyam; Sinding, Mikkel-Holger S.; Ramos-Madrigal, Jazmín; Niemann, Jonas; Samaniego Castruita, Jose A.; Vieira, Filipe G.; Carøe, Christian; Montero, Marc de Manuel; Kuderna, Lukas; Serres, Aitor; González-Basallote, Víctor Manuel; Liu, Yan-Hu; Wang, Guo-Dong; Marques-Bonet, Tomas; Mirarab, Siavash; Fernandes, Carlos; Gaubert, Philippe; Koepfli, Klaus-Peter; Budd, Jane; Rueness, Eli Knispel; Heide-Jørgensen, Mads Peter; Petersen, Bent; Sicheritz-Ponten, Thomas; Bachmann, Lutz; Wiig, Øystein; Hansen, Anders J.; Gilbert, M. Thomas P. (2018). "Interspecific Gene Flow Shaped the Evolution of the Genus Canis". Current Biology. 28 (21): 3441–3449.e5. doi: 10.1016/j.cub.2018.08.041. PMC 6224481. PMID 30344120. ^ Stronen, Astrid V.; Jä™Drzejewska, Bogumiå'a; Pertoldi, Cino; Demontis, Ditte; Randi, Ettore; Niedziaå'Kowska, Magdalena; Pilot, MaÅ'Gorzata; Sidorovich, Vadim E.; Dykyy, Ihor; Kusak, Josip; Tsingarska, Elena; Kojola, Ilpo; Karamanlidis, Alexandros A.; Ornicans, Aivars; Lobkov, Vladimir A.; Dumenko, Vitalii; Czarnomska, Sylwia D. (2013). "North-South Differentiation and a Region of High Diversity in European Wolves (Canis lupus)". PLOS One. 8 (10): e76454. Bibcode: 2013PLoSO...876454S. doi: 10.1371/journal.pone.0076454. PMC 3795770. PMID 24146871. ^ a b Schweizer, Rena M.; Robinson, Jacqueline; Harrigan, Ryan; Silva, Pedro; Galverni, Marco; Musiani, Marco; Green, Richard E.; Novembre, John; Wayne, Robert K. (2016). "Targeted capture and resequencing of 1040 genes reveal environmentally driven functional variation in grey wolves". Molecular Ecology. 25 (1): 357–79. doi: 10.1111/mec.13467. PMID 26562361. ^ Iacolina, Laura; Scandura, Massimo; Gazzola, Andrea; Cappai, Nadia; Capitani, Claudia; Mattioli, Luca; Vercillo, Francesca; Apollonio, Marco (2010). "Y-chromosome microsatellite variation in Italian wolves: A contribution to the study of wolf-dog hybridization patterns". Mammalian Biology - Zeitschrift für Säugetierkunde. 75 (4): 341. doi: 10.1016/j.mambio.2010.02.004. ^ a b c Anderson, T. M.; Vonholdt, B. M.; Candille, S. I.; Musiani, M.; Greco, C.; Stahler, D. R.; Smith, D. W.; Padhukasahasram, B.; Randi, E.; Leonard, J. A.; Bustamante, C. D.; Ostrander, E. A.; Tang, H.; Wayne, R. K.; Barsh, G. S. (2009). "Molecular and Evolutionary History of Melanism in North American Gray Wolves". Science. 323 (5919): 1339–1343. Bibcode: 2009Sci...323.1339A. doi: 10.1126/science.1165448. PMC 2903542. PMID 19197024. ^ a b Kopaliani, N.; Shakarashvili, M.; Gurielidze, Z.; Qurkhuli, T.; Tarkhnishvili, D. (2014). "Gene Flow between Wolf and Shepherd Dog Populations in Georgia (Caucasus)". Journal of Heredity. 105 (3): 345–53. doi: 10.1093/jhered/esu014. PMID 24622972. ^ a b Sinding, Mikkel-Holger S.; Gopalakrishan, Shyam; Vieira, Filipe G.; Samaniego Castruita, Jose A.; Raundrup, Katrine; Heide Jørgensen, Mads Peter; Meldgaard, Morten; Petersen, Bent; Sicheritz-Ponten, Thomas; Mikkelsen, Johan Brus; Marquard-Petersen, Ulf; Dietz, Rune; Sonne, Christian; Dalén, Love; Bachmann, Lutz; Wiig, Øystein; Hansen, Anders J.; Gilbert, M. Thomas P. (2018). "Population genomics of grey wolves and wolf-like canids in North America". PLOS Genetics. 14 (11): e1007745. doi: 10.1371/journal.pgen.1007745. PMC 6231604. PMID 30419012. ^ Hailer, F.; Leonard, J. A. (2008). Harpending, Henry (ed.). 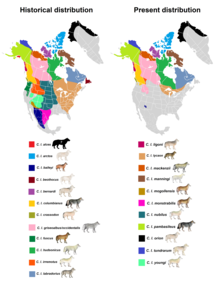 "Hybridization among Three Native North American Canis Species in a Region of Natural Sympatry". PLOS One. 3 (10): e3333. Bibcode: 2008PLoSO...3.3333H. doi: 10.1371/journal.pone.0003333. PMC 2556088. PMID 18841199. ^ a b c d e Mech, D. L. (1974). 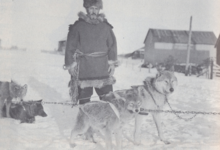 "Canis lupus" (PDF). Mammalian Species. 37 (37): 1–6. doi: 10.2307/3503924. JSTOR 3503924. Archived from the original (PDF) on September 24, 2015. Retrieved June 2, 2015. ^ a b Anyonge, William; Roman, Chris (2006). "New body mass estimates for Canis dirus, the extinct Pleistocene dire wolf". Journal of Vertebrate Paleontology. 26: 209–212. doi: 10.1671/0272-4634(2006)26[209:NBMEFC]2.0.CO;2. ^ Therrien, F. O. (2005). "Mandibular force profiles of extant carnivorans and implications for the feeding behaviour of extinct predators". Journal of Zoology. 267 (3): 249–270. doi: 10.1017/S0952836905007430. ^ Wroe, S.; McHenry, C.; Thomason, J. (2005). 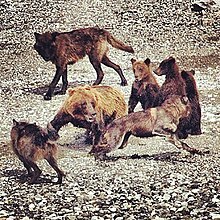 "Bite club: Comparative bite force in big biting mammals and the prediction of predatory behaviour in fossil taxa". Proceedings of the Royal Society B: Biological Sciences. 272 (1563): 619–25. doi: 10.1098/rspb.2004.2986. PMC 1564077. PMID 15817436. ^ Khosravi, R.; Asadi Aghbolaghi, M.; Rezaei, H. R.; Nourani, E.; Kaboli, M. (2014). "Is black coat color in wolves of Iran an evidence of admixed ancestry with dogs?". Journal of Applied Genetics. 56 (1): 97–105. doi: 10.1007/s13353-014-0237-6. PMID 25085671. ^ Mech, L. David. (1999). 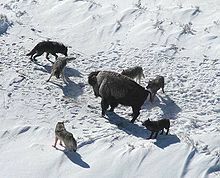 "Alpha status, dominance, and division of labor in wolf packs". Canadian Journal of Zoology. 77 (8): 1196–1203. doi: 10.1139/z99-099. Archived from the original on December 14, 2005. ^ a b Jędrzejewski, W. O.; Schmidt, K.; Theuerkauf, J. R.; Jędrzejewska, B. A.; Kowalczyk, R. (2007). "Territory size of wolves Canis lupus: Linking local (Białowieża Primeval Forest, Poland) and Holarctic-scale patterns". Ecography. 30: 66–76. doi: 10.1111/j.0906-7590.2007.04826.x. ^ Mech, L. D. (1977). 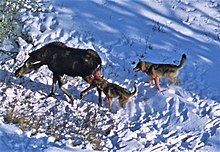 "Wolf-Pack Buffer Zones as Prey Reservoirs". Science. 198 (4314): 320–321. Bibcode: 1977Sci...198..320M. doi: 10.1126/science.198.4314.320. PMID 17770508. ^ Mertl-Millhollen, A. S.; Goodmann, P. A.; Klinghammer, E. (1986). "Wolf scent marking with raised-leg urination". Zoo Biology. 5: 7–20. doi: 10.1002/zoo.1430050103. ^ Paquet, P. C. (1991). "Scent-marking behavior of sympatric wolves (Canis lupus) and coyotes (C.latrans) in Riding Mountain National Park". Canadian Journal of Zoology. 69 (7): 1721–1727. doi: 10.1139/z91-240. ^ Asa, C. S.; Mech, L. D.; Seal, U. S.; Plotka, E. D. (1990). "The influence of social and endocrine factors on urine-marking by captive wolves (Canis lupus)". Hormones and Behavior. 24 (4): 497–509. doi: 10.1016/0018-506X(90)90038-Y. PMID 2286365. ^ Harrington, Fred H. (1981). "Urine-Marking and Caching Behavior in the Wolf". Behaviour. 76 (3/4): 280–288. doi: 10.1163/156853981X00112. JSTOR 4534102. ^ Zub, K; Jedrzejewski, J; Schmidt, W; Theuerkauf, B; Jedrzejewska, K; Kowalczyk, R (2003). "Wolf Pack Territory Marking in the Bialowieza Primeval Forest (Poland)". Behaviour. 140 (5): 635–648. doi: 10.1163/156853903322149478. JSTOR 4536049. ^ Asa, Cheryl S., and Carolina Valdespino. " Canid reproductive biology: an integration of proximate mechanisms and ultimate causes." American Zoologist 38.1 (1998): 251–259. ^ Riedman, M. L. (1982). "The Evolution of Alloparental Care and Adoption in Mammals and Birds". The Quarterly Review of Biology. 57 (4): 405–435. doi: 10.1086/412936. ^ Ueda, Sayoko; Kumagai, Gaku; Otaki, Yusuke; Yamaguchi, Shinya; Kohshima, Shiro (2014). "A Comparison of Facial Color Pattern and Gazing Behavior in Canid Species Suggests Gaze Communication in Gray Wolves (Canis lupus)". PLOS One. 9 (6): e98217. Bibcode: 2014PLoSO...998217U. doi: 10.1371/journal.pone.0098217. PMC 4053341. PMID 24918751. ^ Fox, M. W. (1972). "The Social Significance of Genital Licking in the Wolf, Canis lupus". Journal of Mammalogy. 53 (3): 637–640. doi: 10.2307/1379064. JSTOR 1379064. ^ Peters, R. P.; Mech, L. D. (1975). "Scent-marking in wolves". American Scientist. 63 (6): 628–637. Bibcode: 1975AmSci..63..628P. PMID 1200478. ^ Newsome, Thomas M.; Boitani, Luigi; Chapron, Guillaume; Ciucci, Paolo; Dickman, Christopher R.; Dellinger, Justin A.; López-Bao, José V.; Peterson, Rolf O.; Shores, Carolyn R.; Wirsing, Aaron J.; Ripple, William J. (2016). "Food habits of the world's grey wolves". Mammal Review. 46 (4): 255. doi: 10.1111/mam.12067. ^ Earle, M (1987). "A flexible body mass in social carnivores". American Naturalist. 129 (5): 755–760. doi: 10.1086/284670. ^ Sorkin, Boris (2008). "A biomechanical constraint on body mass in terrestrial mammalian predators". Lethaia. 41 (4): 333–347. doi: 10.1111/j.1502-3931.2007.00091.x. ^ Gable, T. D.; Windels, S. K.; Homkes, A. T. (2018). "Do wolves hunt freshwater fish in spring as a food source?". Mammalian Biology. 91: 30–33. doi: 10.1016/j.mambio.2018.03.007. ^ Biquand, S.; Urios, V.; Boug, A.; Vila, C.; Castroviejo, J.; Nader, I. (1994). "Fishes as diet of a wolf (Canis lupus arabs) in Saudi Arabia". Mammalia. 58 (3): 492–494. doi: 10.1515/mamm.1994.58.3.489. ^ Richardson, E.S; Andriashek, D (2006). "Wolf (Canis lupus) Predation of a Polar Bear (Ursus maritimus) Cub on the Sea Ice off Northwestern Banks Island, Northwest Territories, Canada" (PDF). Arctic. 59 (3): 322–324. doi: 10.14430/arctic318. Retrieved March 16, 2010. ^ H. Monchot and M. Mashkour " Hyenas around the cities. The case of Kaftarkhoun (Kashan- Iran)," Journal of Taphonomy 8/1, 2010, pp.17–32. ^ Dinets, Vladimir; Eligulashvili, Beniamin (February 2016). "Striped hyenas in gray wolf packs: cooperation, commensalism or singular aberration?". Zoology in the Middle East. 62: 85–87. doi: 10.1080/09397140.2016.1144292. ^ (in French) Heinz Staffelbach, Manuel des Alpes suisses. Flore, faune, roches et météorologie, Rossolis, 2009 ( ISBN 978-2-940365-30-2). Also available in German: Heinz Staffelbach, Handbuch Schweizer Alpen. Pflanzen, Tiere, Gesteine und Wetter, Haupt Verlag, 2008 ( ISBN 978-3-258-07638-6). ^ Galaverni, Marco; Caniglia, Romolo; Fabbri, Elena; Milanesi, Pietro; Randi, Ettore (2016). 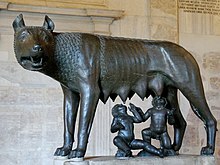 "One, no one, or one hundred thousand: how many wolves are there currently in Italy?". Mammal Research. 61: 13–24. doi: 10.1007/s13364-015-0247-8. ^ Vilà, Carles; Wayne, Robert K. (1997). "Hybridization between Wolves and Dogs". Conservation Biology. 13 (1): 195–198. doi: 10.1046/j.1523-1739.1999.97425.x. JSTOR 2641580. ^ Wang, L; Ma, Y. P.; Zhou, Q. J.; Zhang, Y. P.; Savolaimen, P.; Wang, G. D. (2016). "The geographical distribution of grey wolves (Canis lupus) in China: A systematic review". Zoological Research. 37 (6): 315–326. doi: 10.13918/j.issn.2095-8137.2016.6.315. PMC 5359319. PMID 28105796. ^ Larson, Greger; Larson, Greger (2017). 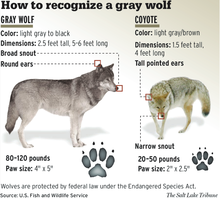 "Reconsidering the distribution of gray wolves". Zoological Research. 38 (3): 115–116. doi: 10.24272/j.issn.2095-8137.2017.021. PMC 5460078. PMID 28585433. ^ a b Sobey, Douglas G. (2007). "An Analysis of the Historical Records for the Native Mammalian Fauna of Prince Edward Island". Canadian Field-Naturalist. 121 (4): 384–396. doi: 10.22621/cfn.v121i4.510. ^ Dubey, J. P.; Jenkins, M. C.; Rajendran, C.; Miska, K.; Ferreira, L. R.; Martins, J.; Kwok, O. C. H.; Choudhary, S. (2011). "Gray wolf (Canis lupus) is a natural definitive host for Neospora caninum". Veterinary Parasitology. 181 (2–4): 382–387. doi: 10.1016/j.vetpar.2011.05.018. PMID 21640485. ^ a b c d e f g h i Lescureux, Nicolas; Linnell, John D.C. (2014). "Warring brothers: The complex interactions between wolves (Canis lupus) and dogs (Canis familiaris) in a conservation context". Biological Conservation. 171: 232–245. doi: 10.1016/j.biocon.2014.01.032. ^ Shivik, John A. (2006). "Tools for the Edge: What's New for Conserving Carnivores". BioScience. 56 (3): 253. doi: 10.1641/0006-3568(2006)056[0253:TFTEWN]2.0.CO;2. ^ Espuno, Nathalie; Lequette, Benoit; Poulle, Marie-Lazarine; Migot, Pierre; Lebreton, Jean-Dominique (2004). "Heterogeneous response to preventive sheep husbandry during wolf recolonization of the French Alps". Wildlife Society Bulletin. 32 (4): 1195–1208. doi: 10.2193/0091-7648(2004)032[1195:HRTPSH]2.0.CO;2.